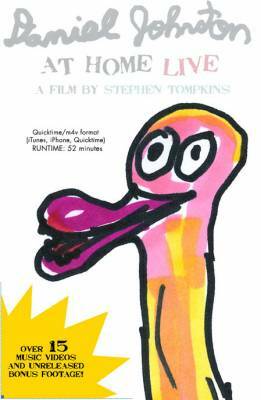 "Daniel Johnston at Home LIVE"
Filmed by artist Stephen Tompkins in 1999 at Daniel Johnston's home in Waller Texas, this cinema verite style music performance documentary reveals Daniel performing many of his known and previously unreleased songs on piano and guitar and musing about his life and thoughts as a performer and artist. A private concert right in Daniel Johnston's home, this is an incredibly rare insight into Daniel's home studio in the late 1990s. This is a bundled package of all the 13 "Daniel Johnston at Home LIVE" videos that are currently selling on iTunes PLUS more improvisation footage and a variety of scenes of Daniel discussing various topics put together as one documentary. iTunes does not offer this as a movie, so this is a great opportunity to get them all for one price as a documentary. This file was created and intended to be played on an iPhone or similar device. Other formats will be made available soon.